Many people are feeling difficulty of writing text on mobile keyboard and I hope you are facing too. If yes then writing through finger is one of the best and enjoyable ways. Google has included a tool already that is useful to enter text with the finger in Google Docs, Gmail and their mobile site too. To use on mobile browser, I have already discussed about how to Use Hindi Handwriting for Search easily on Google. There is no any tough task to enable and use this Handwriting feature, even after enabling this feature on desktop browser you will have to only select a button from the menu to enter your handwritten input. So, firstly let’s know How to Enable Handwriting Input on a Desktop Browser. 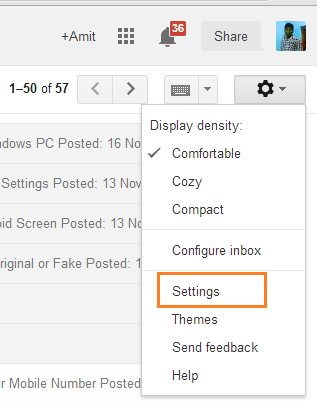 Step 1: firstly, go to Gmail’s settings option. Or you can go direct there by following this link. Step 2: Now under the General tab, make a click on the link of Show all language option and just select Enable input tools. 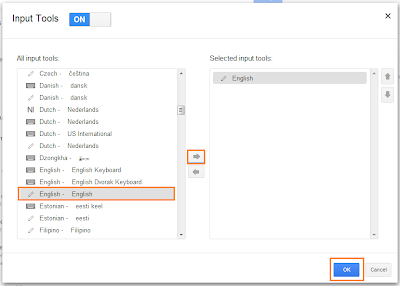 Step 3: From the input tools, find your desired language in the left side column. Select the language option that has a small pencil and then click on the upper arrow directing to the right to add this input tool. Finally click on OK. Step 4: Now scroll down to the bottom of general tab and click on save changes button. 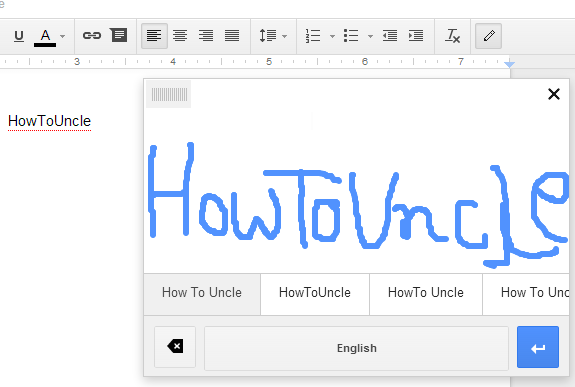 Now the Handwriting input option is successfully enabled on your browser and you can use this feature in Gmail or Google Drive. 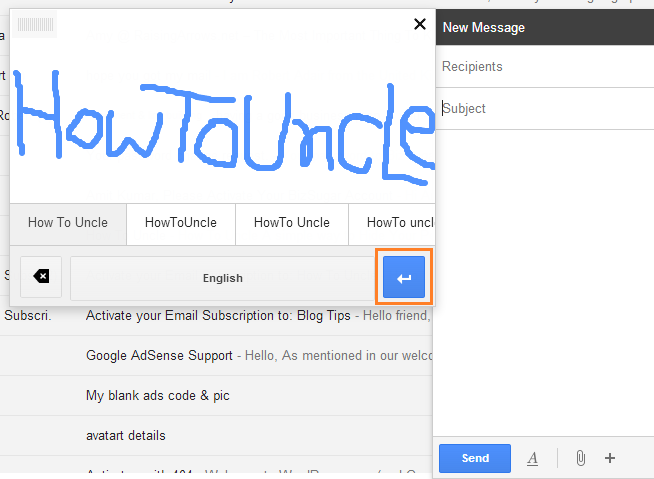 You can start to use this feature in Gmail during composing a message by clicking on the pencil icon. After enabling handwriting input in your browser you will be able to see this pencil icon just under your email address on the top right corner of the screen. When you will click on pencil icon handwriting window will appear. Drag this box according to your comfort and start to compose your message but Ensure you've selected a text area where the handwritten text will be entered. After completing your text click on the blue button to send the written text to the selected area. Few similar texts you will see there, you can select the correct one from there. The handwriting tool in Google Docs is just similar to Gmail, You will have to click on the pencil icon to handwrite tool as shown below. 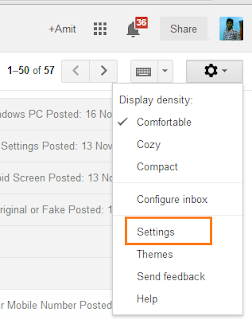 After clicking on the pencil icon exact same handwriting window will emerge for Google Docs as you have shown in Gmail above. So, just write out the text and select a correct word or phrase according to your wish to enter it. 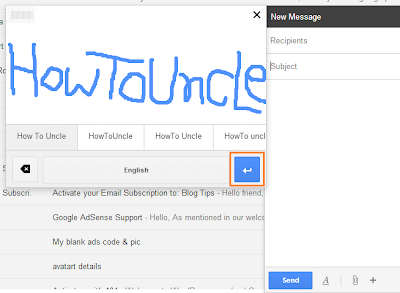 I hope you liked this step-wise tips and trick to Enable Handwriting Input for Gmail and Google Docs. Please give a try and let me know through comments if you face any problem during enabling or using Handwriting Input feature. Looking for more useful tips and tricks, latest updates related to Google then check out our Google tips section.